"In my Stall", which translates as "My Stable" is a gîte in the former hayloft of livestock on the farm Del Navajo, composed of 60 hectares of meadows and ponds . 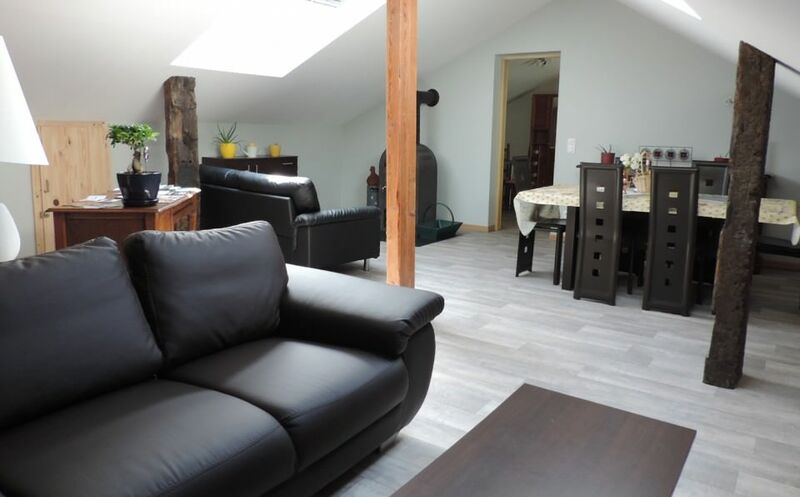 It offers every comfort and wished for a pleasant stay: large living room 50 m² with wood stove, 3 bedrooms with 2 beds each, fully equipped kitchen, an office area, a terrace, a country environment and the proximity of all amenities. It is approved 3 stars by Gîtes de France and has the label 'Welcome to the Farm'; you will have the chance to rub shoulders with horses, chickens and goats. We offer ponies for rent, a fishing pond is available (extra) and walk or bike trails available to you. We welcome of course the horses in boxes or paddocks. Other animals on request. We are at your disposal to meet your demands and expectations and make your time with us a wonderful time.